To keep things simply, I’ll cover the first 14 cards, which were made between June 23rd and July 11th, 1999. Future posts may cover more or less, depending on what feels reasonable and appropriate. Oh boy! This was the very first fake card I EVER made. I mean, literally, THIS particular file, this collection of 0′s and 1′s right here is the first card I ever made. Well, it’s not THAT special given that that particular collection of 0′s and 1′s have been copied and duplicated thousands of times by now. 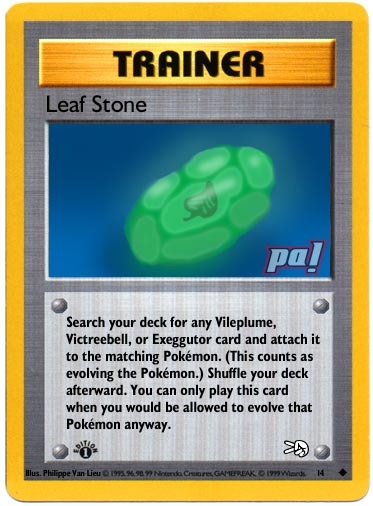 I’ve even made multiple version of this card; one of which is linked right above, and the other can be seen on the “Fan-made card” article on Bulbapedia (or here). This is the other card, it’s “twin” so to speak. 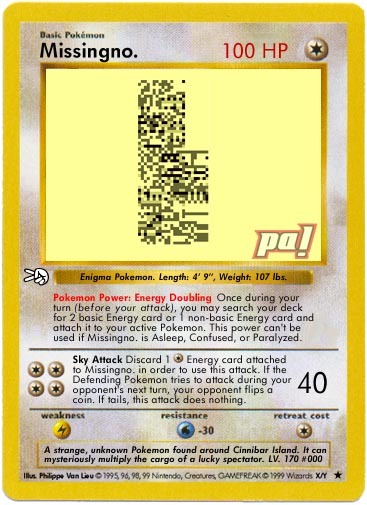 I wanted to try to make this card look a bit more authentic, even renaming “MissingNo.” to “Missingo”, ie. “Missing Flamingo”. As for the card itself, I wanted to do something that would replicate the “Missingno” effect in the TCG, as in, replicating the “duplicating the 6th item in your bag ▓░▚ times”, so I allowed the player to search their deck for energy cards. Effectively this gave the player as many Energy cards they would ever need in the game, although they were stuck playing it on their Active Pokémon, so I felt it was a fair trade off. Even with Blastoise’s “Rain Dance” power, two energy a turn still isn’t THAT much, and I’ll bet that player has alternative ways to grab whatever energy they need. That said, I didn’t think about what could happen if you had more than one MissingNo., but you were still stuck playing it on your Active, and once your Active is all maxed out, then you either have to switch (which may involve discarding Energy), or just not use it. So, still, I feel that it’s chances for abuse was slightly slim. If I REALLY had to balance it further, then I might limit it to just once per turn (so no multiple Powers can be used), and/or having it use up your single Energy attachment per turn. Its attack was something I threw in only because that was just one of its attacks. While I wouldn’t mess with its Pokémon Power so much. Obviously 4 colorless (plus ditching one of them) for 40 and a Tail Whip effect is a bit steep. 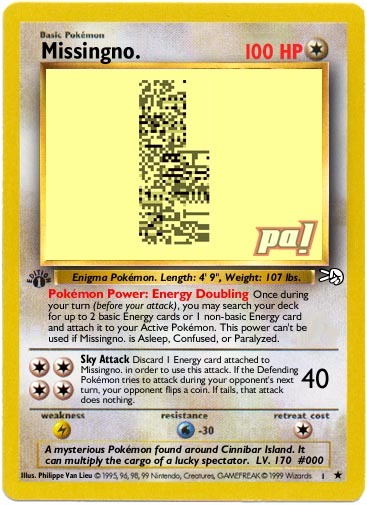 But then again, given how easy it is to get energy in play with Missingno, that too might be a fair balance. So in order to adjust for power creep, I may make it 60-80 damage instead. Back when I started to make fake cards, I wanted to make cards which were new and unique, something that stood out, something that I knew would never exist in real life and so I would need to make it myself. 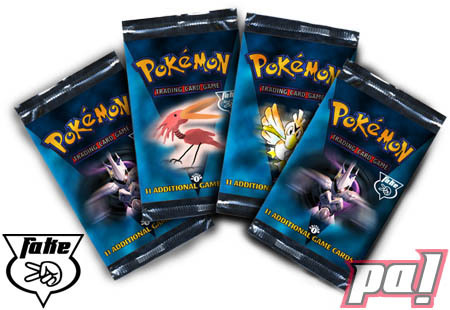 Of course, 20 years later basically every kind of Pokémon TCG cards exists. But 20 years ago, many cards didn’t. At this point in the TCG, the Jungle set had ONLY just been released, and Fossil was still months away. And thus, there was no such thing as a “Mew” card. So I made one!Its power was based on the idea that Mew was the evolutionary ancestor of all Pokémon, and so I figured Mew could be a decent utility for decks: it can be a catch-all Basic Pokémon, thus allowing you to add in whatever Evolution card in your deck for the card itself without worrying about having to include its Basic card. Meanwhile its attack is just a generic “Psychic” attack. But given Mew’s intended utility, I would change the attack to use Colorless energy only, and then have it do extra damage based on the variety of basic Energy card types attached to it. So, say it would use [CCC], do 50+ damage, and 10 more for each different type of Energy type on it (so if all three Energy cards are the same, it does 10+, if there are two different types it does 20+, and so on). Finally, it’s HP and retreat cost seem a bit off… I might just make it 40 HP and [C] retreat. 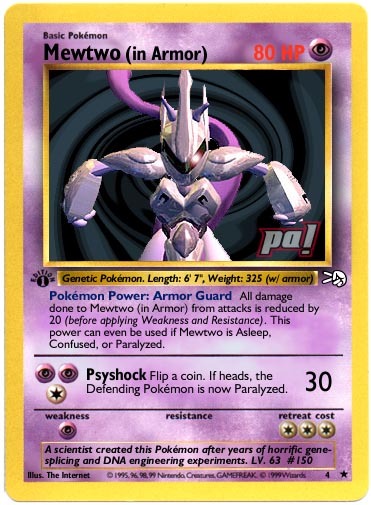 Its Power, Armor Guard, was “Metal Energy” before it existed. And it reduced damage by 20, not just 10. I definitely would keep its power, although I may keep it at 20 damage just to keep thing a bit more balanced, as 20 damage back then was a bit too much! I mean, consider the 10 damage reduction Metal Energy provided, and some of the pain that caused in shutting down some well laid plans. However, I would remove the boilerplate “This power can’t be used…” text and make it “always on”. Its attack was another generic “Psyshock” attack…. 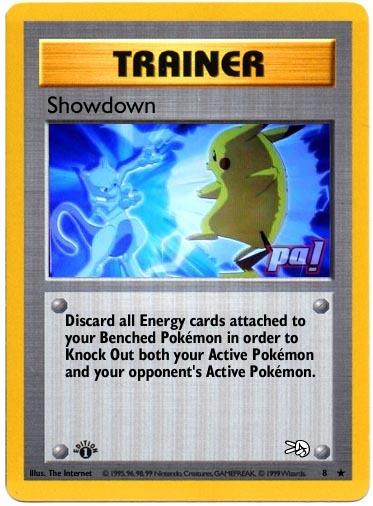 so if I were to remake this card today, I may have it do damage based on the Stage of the Defending Pokémon. So maybe 30 damage to Basic, 60 to Stage 1, and 90 to Stage 2 Pokémon, and then maybe +30 to EX/ex types or other specialty types, etc. The idea is that Mewtwo’s power was so grand that it could toss around big Pokémon… and the bigger they are, the harder they fall. This is the last “Missingno.”-type fake I could do, only this time basing it on the fact that Missingno. tend to have two of the same attacks. 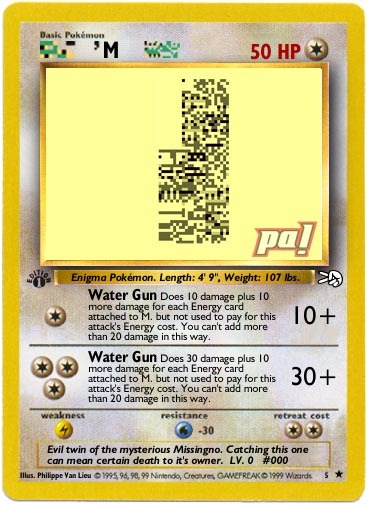 Now since Pokémon cards back in the day either had 1 attack and/or Pokémon Power, or 2 attacks (at least until Gym Challenge’s Rocket’s Mewtwo), basically I opted to just give this Missingno two attacks, and the only two attacks it had two of: Water Gun. Now because the Water Gun attack back then had a limit of 20 extra damage that could be done, I designed it so that it would be staggered, allowing you to do anywhere between 10 and 50 damage if you had 1 to 5 energy on it. And one benefit I added was that it was Energy agnostic, allowing you to toss on any random Energy you had in hand, giving it some extra utility. [C] — Water Gun — (20+) — This attack does 20 more damage times the amount of Energy attached to this Pokémon. [CCC] — Water Gun — (60+) — This attack does 20 more damage times the amount of Energy attached to this Pokémon. This it would look like I wasn’t paying attention. At least having both attacks be literally the same (most likely the first [C](20+) version), then it would seem more deliberate as if I was referencing that Missingno had two of the literally exact same attack. 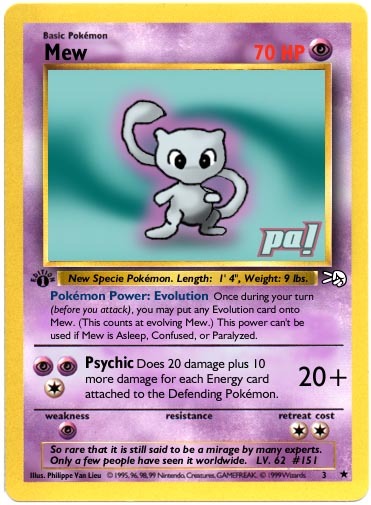 Like the Mew (#3) and Mewtwo (in Armor) (#4) cards above, this Marill Marril card existed only because a reall one did not at the time. There is otherwise nothing special about this card, other than the fact that it was made before a real Marril Marill card. Oh, and I gave it a resistance to Fire, which was a pretty novel idea for Water-type Pokémon. Remaking this one today… I dunno, I’d maybe just give it more utility. Like, I’m impressed with this recent Lotad card, which allows you to shuffle a card back into your opponent’s deck. Now THAT is the kind of stuff I wanted to see back then during the thick of my fake card designing… namely, cards which did something unique, versus just the boring “1 energy = 10 damage” junk. 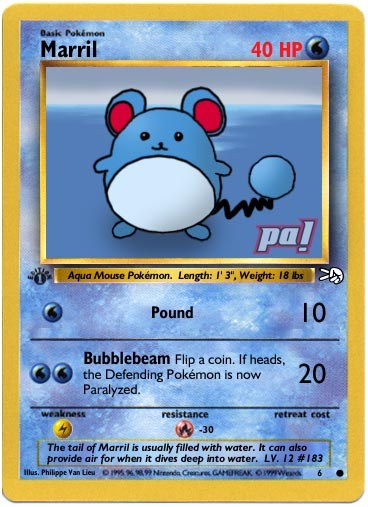 But unfortunately for this card specifically, since I never made an Azumarill card to go with it, I had no plan for he pair, so there was nothing I could do with this Basic Pokémon to make it unique and related to its evolution. So… that’s really it. Another unique card, made before they ever made actual “Technical Machine” cards. But unlike the actual TM cards, mine were more permanent. Nothing special about this card other than the novelty of an actual TM card… I just lifted the attack text from Jungle Clefable; the attack is probably just as useful today as it was back then. I think this card was designed by my best friend Jimmy (aka MegaX back then). 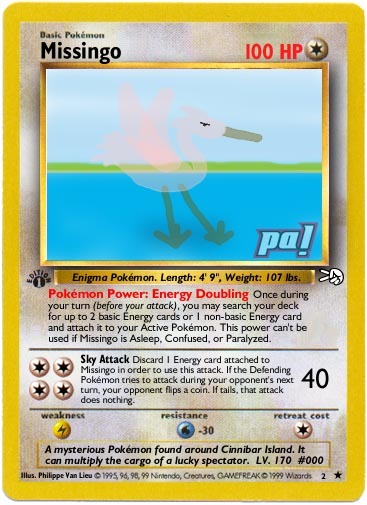 Of course this card is clearly super powered, even by today’s standards, as “all Energy” could mean zero or one, and “your Benched Pokémon” could be just one Pokémon (cuz none on your bench + active KO’s = loss). 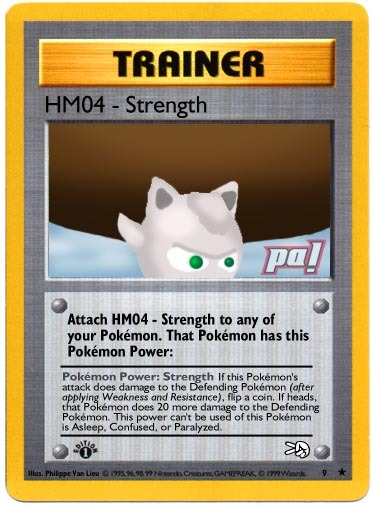 But the idea was to simply toss up a really lame cannon fodder as your Active (like a Pikachu), play this card, and you basically eliminate whatever jerky Pokémon your opponent was playing (like a Mewtwo). I guess your opponent could use it too, and since you only have four in your deck, that balances it right there. If we could remake this card today, I’d maybe change it such that it has higher risk. Like having it be a Supporter, or even an Ace Spec, making sure your Bench is full, and/or then adding as much damage to your Benched Pokémon to knock them out, but then minus 10 damage. Or something along those lines. I’m sure there are ways to keep the essence of this card while keeping it balanced. 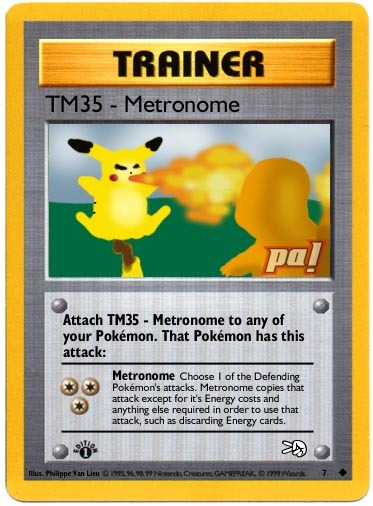 Another TM card, except this one grants a Pokémon Power instead of an attack. I guess the idea was to have this card strengthen whatever Pokémon it was attached it, like a permanent PlusPower. Frankly that seemed a bit unbalanced back then, but it might just work in today’s formats. That said, tossing four permanent PlusPower into your deck might be a bit overpowered itself, so maybe this could be an Ace Spec as well… although in that case I might up the power to 30 or 40 extra damage instead. Just like Marill, Togepi exists only because a real version did not. Boy this is bringing back some vague memories. 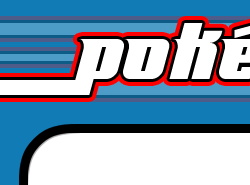 And like the Marill card, its sole purpose was to be something new, nothing more. 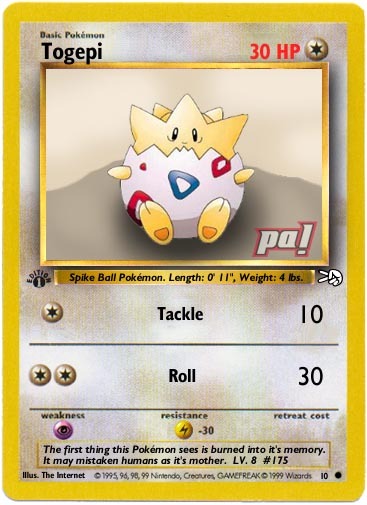 Curiously its weakness and resistance would have nothing to do with what Togepi’s line would end up being… as a Flying-type, it would be weak to Lightning-type Pokémon. And I don’t know where the Psychic weakness came from; maybe it had something to do with the anime? Hm. Finally we come to the last four cards of this post: the Elemental Stones. I had the idea of turning them into cards, just like any other element from Pokémon. 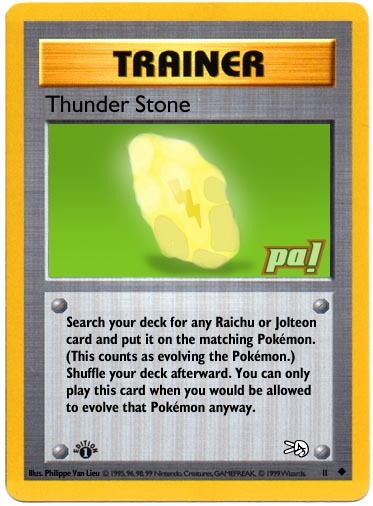 But curiously enough, at least these four stones have NEVER been made into cards, and their only appearance has been on a certain Pokémon’s card art (namely the art for any Pokémon that evolves from that particular stone). 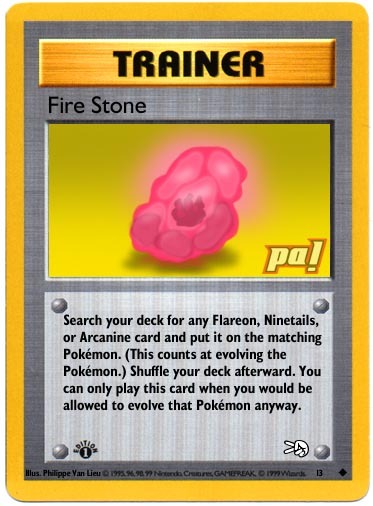 These cards are still arguably viable today, albeit they would need to be updated to cover any new Pokémon that would evolve from it in later Gens, such as evolving Pansear to one of its three Evos. Alternatively, it probably would only need to search for a card to add to your hand instead of evolving it right away, which seems to be the standard now. Another change would be to make sure it covers any Pokémon with that Pokémon’s name in its name, to ensure that it covers more than just the vanilla versions. 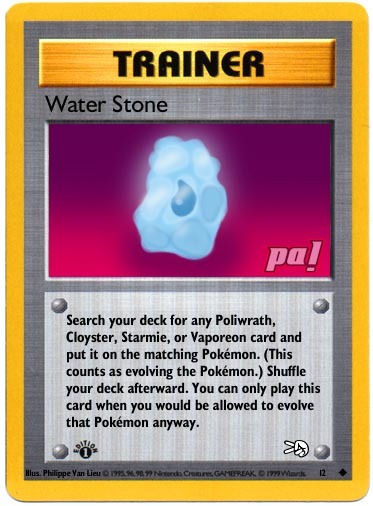 Therefore, if, say, Poliwrath-EX, or Mega-Poliwrath was in your deck, Water Stone (etc) could still be used to grab them from your deck. All that said, I doubt they’ll see much use, outside of trying to grab a specific Pokémon from your deck which just HAPPENS to be a useful card in the current metagame. But isn’t that what these cards are for to begin with? The artwork was based on my own imagination, as a lot of the artwork for them really didn’t exist. I mean, sure, they appeared in the anime, but that wasn’t official video game art. And this is considering that actual pixel art for the items wouldn’t appear until FireRed-LeafGreen, which won’t show up for another 5-ish years or so. So I simply just took a guess based on what did exist. I think I did a fairly decent job making them look a bit transparent and gem-like. Especially given my art skills back in the day. PHEW! What a story about these cards. Of course, there’s plenty more where that came from! I hope to cover more about the set over the upcoming year. I hope you’ll be there to enjoy them all as I share them. Speaking of being somewhere, this is a friendly reminder that April 2019 will be PA!’s 20th Anniversary Extravaganza! I’ll set up a YouTube video chat thingy for us to chat and share memories, etc, about the good ol’ days of the website. Like when we had an actual community. Anyways, I hope you can join me for it! I’ll be sure to include a few guest stars as well, like classic PA! staff members like RyoShinX and MegaX (but probably not PokémonMasterX)! X-pect to have some fun! !